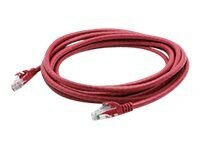 This is a 3m, red, Cat6, molded, snagless, shielded, plenum patch cable. Cat6 allows frequencies up to 300MHz. It performs at improved specifications, in particular in the area of alien crosstalk, as compared to Cat6 UTP (unshielded twisted pair).